WHAT: Biomaterials are the basis of technologies which interface artificial structures with living organisms. An important issue in this field is biocompatibility, which is often linked to specificity in first interactions of a material with particular proteins. Preferrential attachment of specific proteins to individual components of surface phase segregated polymers is believed to be a critical aspect of biocompatibility. We are using Scanning Transmission X-Ray Microscopy (STXM) to study this problem. 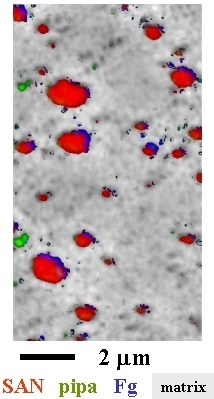 Figure 1 is a false-color composite image showing how X-ray microscopy can be used to map the distribution of thin layers of fibrinogen (a key blood protein) relative to two filler particle components - StyreneAcrylonitrile (SAN) and poly-isocyanate poly-addition product (pipa) in a model polyurethane (supplied courtesy of Dow Chemical). The sample is prepared by depositing fibrinogen from a dilute buffer solution and was measured under 5-10 micron of water. The quantitative color coded chemical map was derived by pixel-by-pixel fits of C 1s absoprtion spectra to reference spectra of the pure material. Figure 2 plots the fit to the spectrum extracted from the blue pixels where the fibrinogen is most dense. 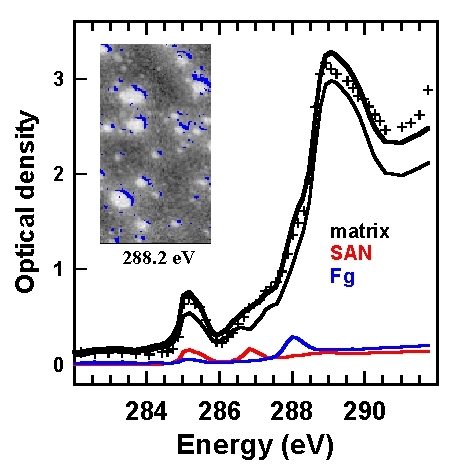 Other work has shown that STXM is capable of detecting adsorbed protein at the monolayer level. J. Biomaterials Science: Polymers (2002) in press. Credits: Polymer sample courtesy of Gary Mitchell (Dow Chemical). Work carried out at BL 7.0.1 STXM by Cynthia Morin, Tolek Tyliszczak, Hiromi Ikeura-Sekiguchi and Adam Hitchcock. Curve fit carried out using conjugate gradient optimization, courtesy of Bill Loo (Stanford). Research supported by NSERC (Canada) and the Canada Research Chair program.